What do Sikhs think about the new Yogi Bhajan 3HO Sikh Dharma logo which depicts Bhajan's "Adi Shakti" above five yogi like figures? 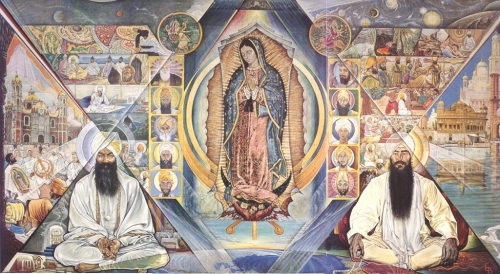 Yogi Bhajan's Sikh Dharma wants these five yogi like figures to represent the "Panj Piare", below what 3HO calls the "Adi Shakti" but the five yogi like figures in the logo are NOT wearing dastars or kirpans! I bow to (or call on) the all-encompassing power and energy. "Merge in the Maha Shakti. This is enough to take away your misfortune. This will carve out of you a woman. Woman needs her own Shakti, not anybody else will do it. When a woman chants the Kundalini Bhakti mantra, God clears the way. This is not a religion, it is a reality. Woman is not born to suffer, and woman needs her own power." "When India and Indian women knew this mantra, it dwelt in the land of milk and honey." Yogi Bhajan taught that after conception, the soul enters into the womb of a mother on the 120th day. This is a day of celebration and when the soul/child is entering the womb this chant is traditional. 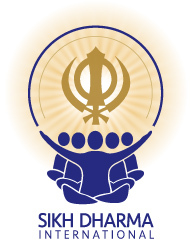 Since reestablishing Sikh Dharma International, a little over a year ago, it has been on our agenda to re-position the brand identity of our organization to portray a new perspective and a fresh sense of who we are and where we want to go. We are very glad to announce that we have completed this process and we are proud to show you our new logo. As you look at this new logo, it will be obvious that we have embraced the "family" concept in relation to having our identity connect to the identities of our sister Legacy non-profit organizations, 3HO and KRI (Kundalini Yoga Research Institute). In using the iconic representation of people, as originated in the KRI logo, we acknowledge our sibling relationship. Using five symbolic people we inject the "Panj Piare" concept from our rich Sikh tradition and invoke the idea of "Sangat". Placing the "Adi Shakti" above the representation of the sangat, in a place of reverence and adoration, we proclaim this sacred symbol as being the embodiment of all things Sikh Dharma and to be at the very center of our worship. In addition to portraying our deep spirituality, we believe that the graphic simplicity and symbolic correctness combine to make this logo powerful and relevant. Our hope is that this image will attract, inspire and encourage expansion of our organization and all that we do.